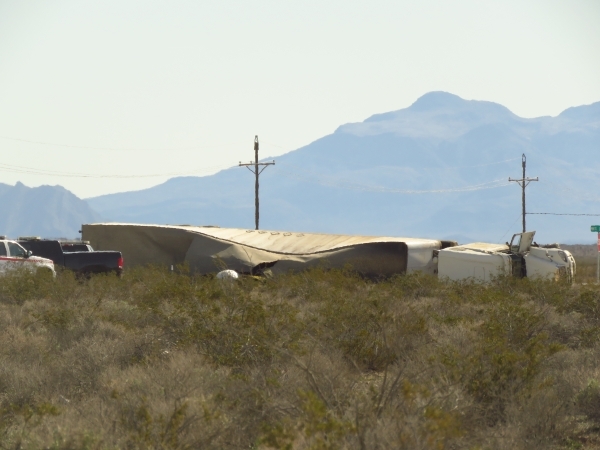 A two-vehicle collision that sent a tractor-trailer onto its side near Amargosa Valley required a Hazmat response from Pahrump Valley Fire and Rescue Services and Nye County Emergency Services around 9:30 a.m. on Thursday morning. The crash happened along State Route 373 near White Sands Road, closing the area for most of the day. It was still closed at press time. Fire Chief Scott Lewis said the waste materials were destined to go to US Ecology Nevada, a waste treatment facility nearly 20 miles north of Amargosa which processes and converts hazardous inorganic wastes into non-hazardous, delisted residues. None of the waste material being transported was radioactive, Lewis said. The waste products en route to the facility varied in nature, Lewis said. The highway remained closed to through traffic throughout Thursday afternoon. Lewis said motorists could navigate their way around the scene by taking secondary roads. Several people were evaluated but declined medical treatment. A US Ecology site has been the focus of a state investigation into an industrial fire in October that shut down U.S. Highway 95 from Tonopah to the State Route 160 interchange north of Crystal. A full-scale remediation of the US Ecology industrial site could cost millions of dollars, state officials said during a meeting on Monday. A group of state officials who presented the findings from the report into the October industrial fire at the US Ecology site said the state is working with several private engineering companies that are expected to provide costs of permanent repairs for the site.